In a metal 9" x 13" baking ban, add tomatoes, garlic, oil, vinegar and oregano - season with salt and fresh ground black pepper, tossing well to combine. Place into the oven and roast until the tomatoes have shriveled, about 20 minutes. Remove pan from the oven and stir in beans. Place back into the oven and continue roasting until the beans have warmed through, about 5 minutes. Meanwhile, in a medium skillet, melt butter over medium heat - stir in bread crumbs and toast until golden and crisp, about 3 to 4 minutes. Meanwhile, in large pot of boiling salted water, stir in pasta and cook according to package directions. Drain and place pasta back into the pot. Stir in roasted tomato mixture, parsley and half of the cheese, tossing to coat. 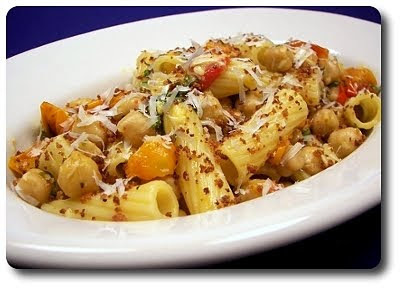 Serve with each portion sprinkled with the toasted breadcrumbs and an even amount of the remaining cheese on top. This is definitely on the menu this week. It looks wonderful!